These home wet bars span the style spectrum, whether they’re the star of the room or hidden behind a closet door. September 29, 2018 – Somewhere between a portable bar cart and a home bar lies the classically cool wet bar. As a destination for mixing favorite cocktails and mocktails, all wet bars include a sink — hence the “wet” part of the name — but beyond that, a wet bar can include anything from a few shelves to a bevy of built-in appliances. 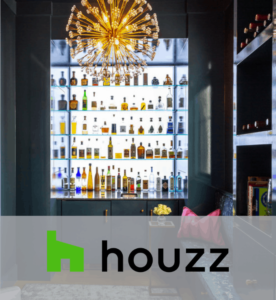 These 50 wet bars showcase the range of styles and amenities that designers and homeowners are using for home bars now. 1. Designer Amy Lau transformed an alcove in the family room of this Hamptons, New York, beach house into a wet bar featuring light blue tile shimmering against walnut cabinetry. 2. Three reclaimed-wood shelves on a shiplap wall add charm to a wet bar designed by Rebecca Driggs Interiors for a house in Raleigh, North Carolina. 3. Frosted glass doors slide via a steel rail and skateboard wheels to reveal floating shelves in a Denver wet bar created by Rumor Design + reDesign. 4. A brick wall covered in metallic bronze paint creates the backdrop for this Nashville, Tennessee, bar by Sara Ray Interior Design. Other designer touches include a matte black faucet and brass chandelier. 5. This Dallas wet bar by Stocker Hoesterey Montenegro features cabinets painted French blue, brass pulls and soapstone countertops. 6. This corner wet bar in Chicago, by Cari Giannoulias Design, features a built-in wine refrigerator with a freezer and an ice maker below. The lower cabinets are oak with a cerused finish. The technique uses liming wax or white paint to accentuate the wood grain. 7. Espresso stained cabinets and a concrete-look tile backsplash make for a dramatic wet bar in this Grand Rapids, Michigan, home by 42 North. 8. This wet bar in South Carolina, built by Manello Construction, features electric blue lacquered cabinets and a geometric-pattern wallpaper that makes the space look like a work of art. 9. This glamorous corner wet bar in Houston, by Wyrick Residential Design, includes a backsplash covered in mirrored subway tiles, a silver-finish hammered-copper sink and a built-in wine rack. 10. Vibrant wallpaper, lemons, limes and an assortment of plants bring tropical style to a colorful New Orleans wet bar designed by Valerie Legras Atelier. A metal-and-glass shelving unit provides storage while allowing the wallpaper to shine. 11. This sophisticated San Francisco home, by Geremia Design, includes a library with a custom walnut-and-marble bar. 12. The cabinets, walls and louvered blinds are all finished with royal blue lacquer, making a grand statement in this Minneapolis wet bar built by Refined. 13. This Chicago wet bar tucked under an arch provides an elegant place for making a drink. The bar, designed by Orren Pickell Building Group, features glass subway tile and glass-front cabinets. 14. A wall of backlit frosted glass and a dazzling chandelier create a club-like atmosphere at this Milwaukee wet bar, designed by Karen Kempf Interiors. 15. Seeded-glass-front cabinets, brass hardware and fixtures, and a stained walnut countertop make for a charming traditional bar, designed by Tineke Triggs in San Francisco. 16. This Charleston, South Carolina, bar by The Anderson Studio of Architecture & Designfills a former closet. The space features cerused oak on the walls, cabinets and floating shelf. 17. Alan Clark Architects used navy blue painted cabinets, brass fixtures and a dark walnut countertop to create this handsome bar in Atlanta. 18. This bar, designed by Lisa Lev Design for a Toronto living room, has geometric wallpaper, glass shelves and a marble countertop. 19. Chalkboard covers the wall in this Charleston, South Carolina, bar by Herlong & Associates, leaving enough space for the homeowners to scrawl out the evening’s cocktail list if they so desire. 20. This industrial-style wet bar in San Francisco, by Knock Architecture and Design, features hot-rolled steel and salvaged wood. 21. Wallpaper with bottle silhouettes covers the backsplash of this bar in Cleveland, built by Manorbrook Homes. 22. Gallagher Interiors turned a formal living room in Dallas into a hip lounge with a built-in wet bar. The glass shelves hold a bourbon collection, a nod to the owners’ former home in Louisville, Kentucky. 23. A basement bar in Grand Rapids, Michigan, designed by Villa Décor, is awash in white. The space includes white Shaker-style cabinets, marble countertops and shiny silver hardware. 24. This moody bar near Chicago, built by Redstart Construction, has ebony stained cabinets, black tile in a chevron pattern and black quartz countertops. 25. This charming bar in Charleston, South Carolina, by Cortney Bishop Design, makes use of space under some stairs. Highlights include a wood countertop, cabinets and shelves finished in a high-gloss stain. 26. Athens Building covered the backsplash of this Atlanta wet bar with fish scale tile in three shades of blue. Navy paint behind the open shelves in the center picks up the darkest color in the tile. 27. Bold red lacquered cabinets and a mirrored subway tile backsplash make for an attention-demanding wet bar in New York City, by J Cohler Mason Design. 28. Case Design/Remodelingdesigned this stylish corner bar for the 2017 DC Design House. Cappuccino-colored lower cabinets, brass hardware and a chocolate-brown ceiling combine to make a warm and sophisticated space. 29. The black-and-white color palette for this Nashville, Tennessee, bar built by Merrill Construction Group benefits from touches of brass via the sconces, hardware and undermount sink. 30. Glass-front cabinets showcase the liquor and glasses in this stylish white-and-brass San Diego wet bar designed by Inplace Studio. Note the brass toe kick and geometric-tile-covered backsplash. 31. A mirrored back wall behind floating white shelves enlarges the look of this sleek Miami home bar, designed by 2id Interiors. 32. This niche designed by Cillian Johnston is in the kitchen of a house in Dublin. The wet bar can be hidden behind the two black doors. 33. Honey-toned wood, grasscloth wallpaper, an arched ceiling and stained glass-front cabinets create a warm, homey bar area in Phoenix. 34. This classic Providence, Rhode Island, wet bar by Paul Weber Architect features a solid slab backsplash and a soapstone countertop that pairs beautifully with an antiqued copper faucet. 35. This stylish wet bar was designed by D Christjan Fine Cabinetry Design & Manufacturing for the 2107 Pasadena Showcase House. Its brass-framed shelving unit makes a grand statement above the sink. 36. Tucked under the stairs in a Toronto house, this white-and-wood wet bar by Jennifer Worts Design is as cute as a button. 37. This handsome wet bar, designed by Vani Sayeed Studios for the 2017 Boston Show House, has bright red walls, white subway tile and a pair of stained wood floating shelves. 38. Arched wood-and-glass doors open to reveal a wet bar designed by Cockfield Jackson Architects for a house in New Orleans. The space includes a built-in wine rack above the glass-front cabinets. 39. The doors fold open to reveal a stylish wet bar in this Boston living room, designed by Annie Hall Interiors. Highlights include built-in walnut cabinets. 40. The backsplash of this Miami wet bar by MET Interiors is clad in ceramic subway tile with a horizontal line of small glass tiles that add just a note of color to this cream-toned space. 41. This wet bar in South Carolina, designed by Arlene Williams, is just off the kitchen. Its sage-green cabinets provide a subtle contrast to the white kitchen. 42. Retro-style cabinets provide the ideal look for a bar in a Portland, Oregon, midcentury house designed by Risa Boyer Architecture. 43. This Vancouver home bar designed by Citation Kitchenshas horizontal-grain rift-cut white oak cabinetry, a built-in full-height wine fridge and a floating shelf. 44. Beadboard cabinets, glass shelves and gray subway tile combine to make a coastal-chic bar for a New York beach house designed by Thom Filicia. 45. This Cincinnati family room wet bar, built by Michaelson Homes, features a metallic tile backsplash and glass-front doors. 46. This coastal-chic home bar in Jacksonville, Florida, by Amanda Webster Design, includes a stained wood backsplash, a soapstone counter and upper cabinets with integrated wine racks. 47. Built in a former closet, this living room wet bar in San Francisco by Sutro Architects has a mirrored backsplash, glass shelves and a marble countertop. 48. Cara Woodhouse Interiorsused golden onyx to create the countertop, back wall and shelves of this Brooklyn, New York, bar. 49. Decorative doors fold back to reveal a bar in this New York house designed by James Rixner. The space includes a classic marble countertop, Shaker-style cabinets and stainless steel hardware. 50. This rustic-meets-modern bar in Denver, built by Meadow Mountain Homes, features gray-washed wood cabinets and a backsplash covered in bold Ann Sacks tile. Have a project we can help with? We would love to hear from you. Contact us today!